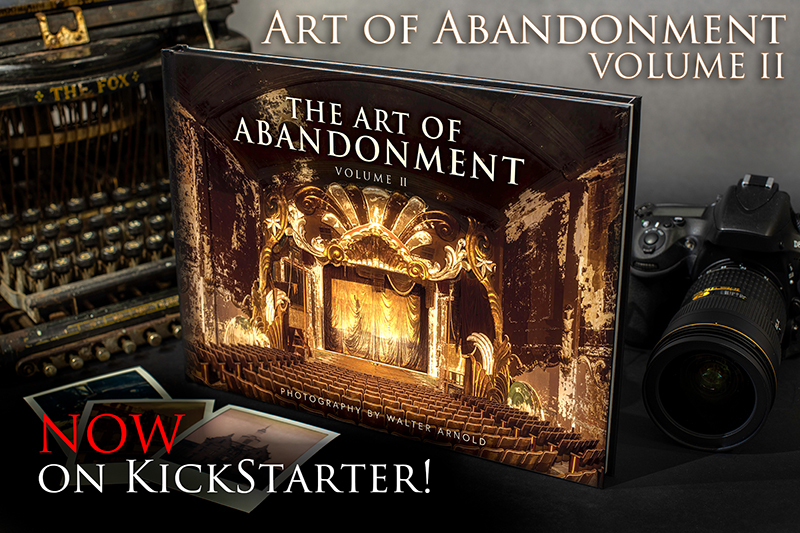 My second photo book in the Art of Abandonment series is now live on KickStarter! CLICK HERE to head over to the KickStarter page and back the project! The Art of Abandonment Volume II, is a 176 page, 9″x12” hardcover book. It features full-color photos and histories of sixteen different historic places! Fourteen previously unpublished locations, and two locations from the original book that have been revisited after restoration. If you are not familier with Kickstarter; it is a platform for creators to crowdsource funding for their projects, while also offering their supporters special rewards and discounts not available anywhere else. For this project, I am using the funds raised to help cover a portion of the initial cost of self-publishing, designing, and printing the first 2000 books. For this project, I am using the funds raised to help cover a portion of the initial cost of self-publishing, designing, and printing the first 2000 books. There are special offers available and discounts on prints and metal prints for different reward tiers. I cannot wait to get this new book printed and in your hands, and by supporting this on KickStarter you will be helping bring this project to life, while also being first in line to get a copy of the book before it becomes available anywhere else! The Kickstarter campaign will be live for the next 30 days (until April 18th). My goal is to have all the books produced, printed, and shipping out to all of the KickStarter backers before the end of the year. Kickstarter backers will get their copies of the book before anyone else! I would like sincerely thank you for your support, and your consideration for funding this project. Without patrons and supporters of the arts, I would not be able to continue producing this series!